Live albums from your common-or-garden indie types are never an enticing prospect, generally amounting to a rough hobble through a scant catalogue. Not only is the sound still pubescent, but the whole caper can have the air of fiscal desperation about it, labels cashing in on a fickle audience before their attention moves elsewhere. No doubt some sadistic A&R is already pondering the repugnant prospect of Jamie T " Live in Staines. 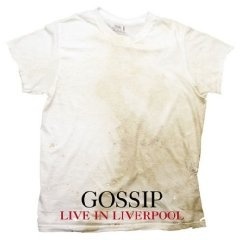 The Gossip's Live in Liverpool (the best guitar album to emerge from the city in 15 years) is far from this mundane proposition, however. It provides a bridge between the band's origins in the radical underground of the US Pacific North West and their current status as a chart-topping pop act. For more recent fans who missed them on those early slogs around gutter venues and Ladyfests of the world there's an introduction to tracks from pre-Standing In The Way Of Control albums That's Not What I Heard (2000) and Movement (2003). The eight-year-old, minute-long 'Swing Low' is an early blueprint for the pop missile that blasted The Gossip and their (often misinterpreted) radical politics into the mainstream, Ditto's ode to Sapphic love staccato over a lo-fi take on the blues. Similarly, 'Fire/Sign' (from Movement) has a tumbling excitement that the band made sassy on Standing In The Way of Control. Live In Liverpool also showcases The Gossip as being more than just an anonymous band backing up Beth Ditto's terrific set of pipes, something that was a little lost on their most recent album. The influence of Sonic Youth on Nathan Howdeswell's rambunctious guitar and bass is clear on the throaty 'Eyes Open' and 'Keeping You Alive', while Hannah Blilie's drums are more than the vehicle for a Soulwax remix that they occasionally became on record. This reveals Ditto's voice for what it truly is, raw, rough and ready rather than a mere homage to singers past. Predictably, Standing In The Way Of Control itself gets the biggest scream from the hormonally appreciative crowd. Yet as perhaps the only band around who you'll hear dedicating one song “to the dykes” and the next “to Aaliyah and Timberland”, 'Live In Liverpool' is no exploitation of a passing fad but a pause for breath before The Gossip move on to ever greater things.